Still need a cute dessert idea for Thanksgiving? Or maybe a cute little treat to make for the kids or even for the kids to make? 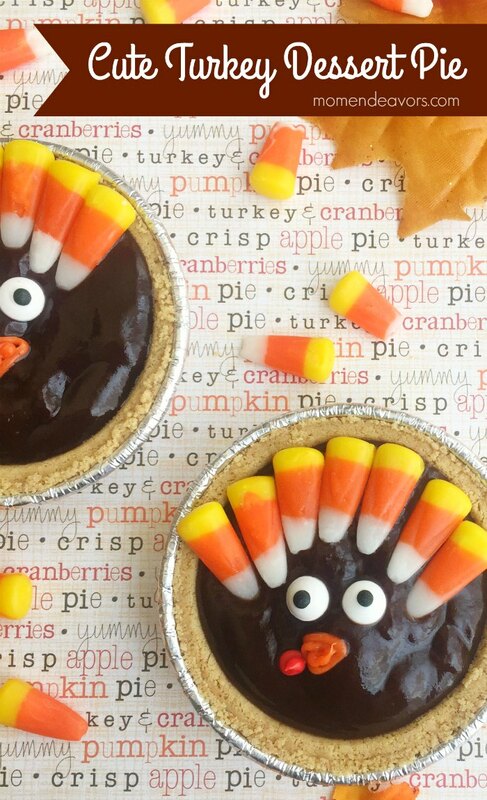 Then, these cute turkey dessert pies are a great idea! Aren’t they fun?! They are SO easy to make – adorable for the kids. Or, you could really make them a fun activity to make with the kids for Thanksgiving. 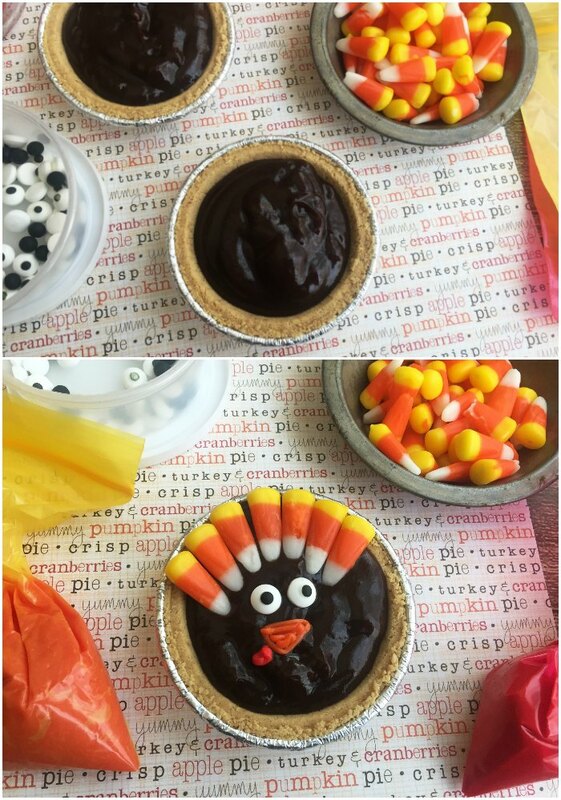 What kids wouldn’t want little pies with candy?! Perfect!! If you’re making it for the kids, then this can come together so quickly. Or, you can set everything out in little dishes and let them put together their own turkeys. It could be even fun to keep the little ones busy while everyone else is prepping the rest of the Thanksgiving meal stuff! These chocolate turkeys make a cute Thanksgiving dessert treat! Prepare the chocolate pudding according to the package directions and let set. Scoop the chocolate pudding into the mini pie crusts. 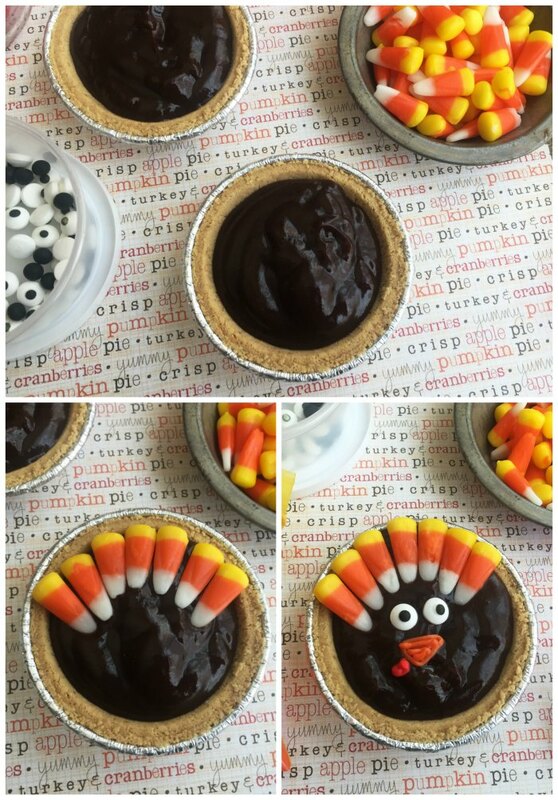 Decorate the pudding pies as turkeys - Give each turkey 2 candy eyes. Use 6-7 candy corn for the turkey's feathers. Scoop the orange frosting into a small sandwich baggie and snip one corner with the kitchen scissors. Gently squeeze the frosting out to the make a triangle beak. Scoop the red frosting into the other small sandwich baggie and snip one corner of baggie and gently squeeze the red frosting out forming a red waddle under the turkey's orange beak. Easy peasy! 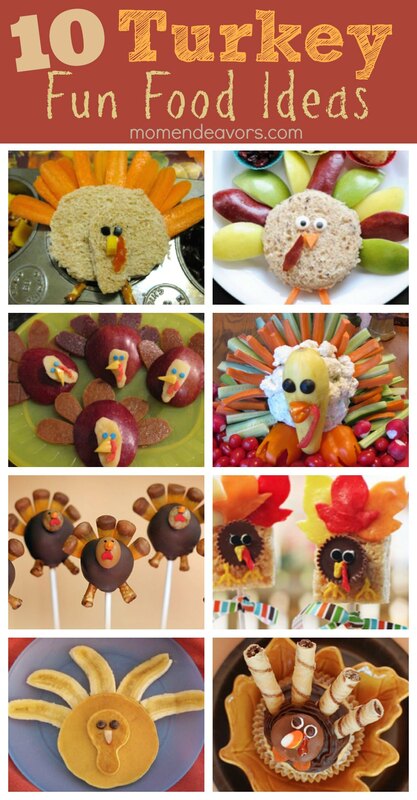 A fun little Thanksgiving treat that kids especially are sure to gobble up! Enjoy and Happy Thanksgiving!! !